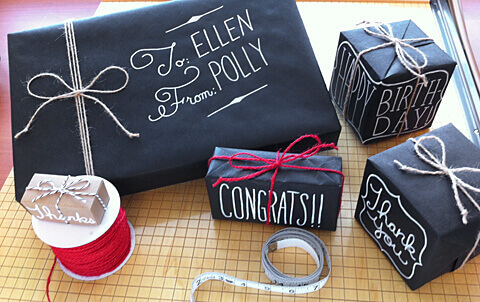 Add a little chalk marker, and our Chalkboard Gift Wrap looks just like a chalkboard! See our entire Chalkboard Collection here! You can also use these markers, available at most craft supply stores or online like our favorite Chalk Ink, on our 100% Recycled Black Kraft Shopping Bags or Black Merchandise Bags (below). Use a regular pencil to sketch out your design first, then trace over it with the chalk marker. Once the marker is dry, you can erase the pencil marks. Top the gift with some of our new Burlap Twine for an adorable, handmade look. And don’t be concerned if your lettering doesn’t look “perfect” – that’s part of the charm! Watch the video below for a few gift wrap tips, including using a tape measure to help cut the wrap to the correct size and double-stick tape for a more finished look. See our new Chalkboard Collection here! Priscilla, this is a great post! I’ve been looking for interesting wrapping ideas for my boyfriend’s birthday and came across this. It’s an old post but I’ve never seen this before – thanks for the idea. Wow this is such a good idea! I always have excess of ribbon when I should really be using some twine from around the house. Thanks for the inspiration! Perfect idea for this xmas! I will definitely have to try it. Thank you! Great idea!! Where can I found a chalk maker?? I love this so much! Great idea, you will never be caught without appropriate gift wrap. I love this idea. I only wish that Nashville Wraps would offer this paper roll in the 24″ x 100′ size. Please, please put in a request for that! Thank you! I love this idea and tutorial!! Quick question, I liked the pencil you showed in the video. It seemed to have a rectangular eraser. What brand was the pencil? Love this! I’ve also used the chalkboard paper roll for my taco bar! It turned out fabulous & everyone loved it! What a brilliant idea! I wish I could find the time to do this. Also, I wish I had a little better hand writing but I think this is darling. Well done! This is a great idea. I’m definitely going to have to try it myself.Thanks for posting! Great idea Priscilla, so fun, and simple. 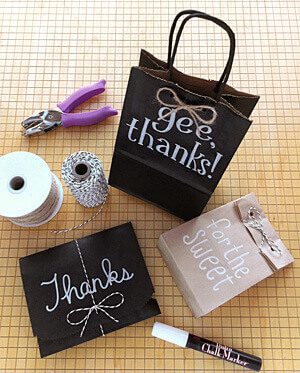 I’ve always had double stick tape around, but never thought to use it on my gift wraps, so another fine suggestion. I thought this would be a great idea for holiday window displays and wrapping gifts in the store…but this is great for a back to school window display too!!!! !